Jitish Kallat, Anger at the Speed of Fright, acrylic and resin hand-painted figures. © Jitish Kallat, courtesy of Haunch of Venison. LONDON.- In February 2009, Haunch of Venison London will present an exhibition of new work by the Indian artist Jitish Kallat. Following his acclaimed exhibition at Haunch of Venison Zürich in 2008, Kallats new work showcases the full range of his visual vocabulary incorporating video, sculptural installation, photography and the large format paintings for which he is best known. Tackling his foundational themes of sustenance, survival and mortality in the contemporary urban environment of Mumbai, Kallat offsets a vivid, hand-made aesthetic with digitised renderings of streets fit-to-burst, where the cumulative impression of daily existence is pushed to the extreme. At the heart of the artists interest in the bustling metropolis lies the experience of the individual within the crowd. This is driven by a play on scale, understood in terms of a subjects physical and metaphorical presence. Across two and three dimensions, using a variety of media, and through assimilating the local with the universal, Kallat checks the twenty-first centurys obsession with effects  images, food, products, even people  by repositioning them in unfamiliar environments. A large video projection shows x-rayed foodstuffs projected onto a dark celestial space and pouring into view as asteroids, stellar formations, planetary clusters and nebulae. 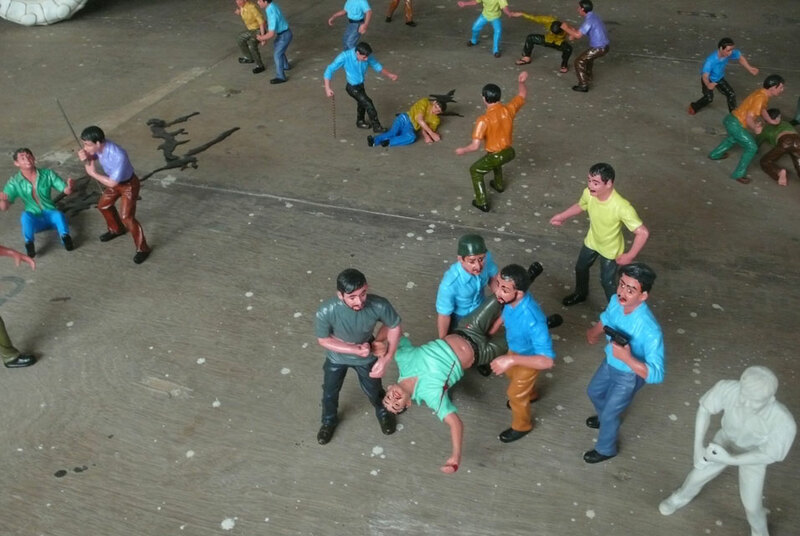 In a sculptural installation, a miniature crowd of rioting figures scatters across the floor, their scale exaggerated by the viewers height, as if seen through the wrong end of a telescope. Another piece in the exhibition is an intricately treated sculpture of an oversized black lead kerosene stove that carries more than a hundred images on it. These are culled from the porch of the Victoria Terminus building which is the nerve centre of Mumbais commuter action. Curiously, the decorative architectural friezes carry several images of animals devouring each other and clinging onto various foods. Viewed together on a single sculpture, this sprawling mass is not unlike the daily grind of survival that this porch bears witness to. In large paintings elsewhere, the body is abstracted into ink blot formations, its stretched muscles and dripping fluids becoming receptacles of urban trauma. our legs are stiff and knock together  distils the world, half-here and half-there, mine yet theirs, which Kallat repeatedly evokes. Jitish Kallat (born Mumbai, 1974) studied painting at the Sir J.J. School of Art in Mumbai and has participated in numerous solo and group exhibitions internationally. In addition to his inclusion in important museum exhibitions such as Indian Highway at the Serpentine Gallery, London (2009), Chalo! Indua: A New Era of Indian Art at the Mori Art Museum, Tokyo (2008), Thermocline of Art  New Asian Waves at the ZKM Museum in Karlsruhe (2007) and Century City at Tate Modern in London (2001), Kallat has participated widely in biennials and triennials, including The 3rd Guangzhou Triennial in China (2008), The 5th Asia Pacific Triennial of Contemporary Art in Australia (2006) and The 6th Gwangju Biennale in Korea (2006). Recent solo exhibitions have taken place with galleries in Beijing, London and Mumbai. Kallats work is held in a number of important public and private collections internationally including MOCA, Los Angeles, the Saatchi collection and the Frank Cohen collection.